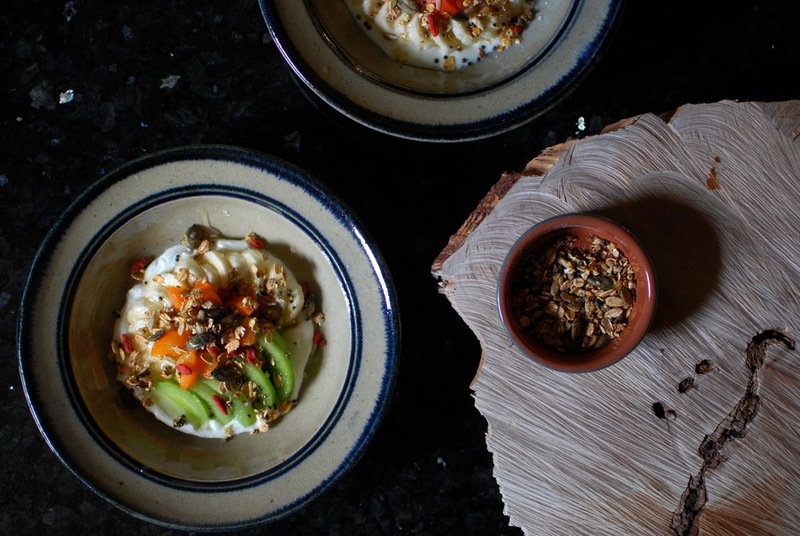 I can never remember to make Granola, until I actually want Granola, by which time it is far too late to make any, and I just don’t have the freedom to purchase beautiful artisanal granola to satisfy each craving. A friend once said, through necessity is born genius. Not claiming to be genius by any means, but merely to say that through this existential-granola-dilemma, a solution was born: Shortcut Granola. So, cue the most perfect solution to all your quick-fix breakfasts, for all you last minute brunch organisers, granola cravers, innovative soup and salad toppers. And basically all around multi-purpose sweet and salty treat. I should also mention that while eating this for breakfast this morning, to my right was a box of once-delicious Amaretto cookies. They are now perfectly stale. What does my mum say? Those would be perfect for toasting and sprinkling over desserts. YES mum. #NoWaste #ThinkBeforeYouToss. Yes, I just hashtagged my post (not something I could ever have foreshadowed, not for the life of me) and yes, proof, this Shortcut Granola can inspire all who eat it to save the world, one plate of leftovers at a time. Toss Oats, seed mix and pinch of salt into a small frying pan, and place over medium high heat. Toast for 2-4 minutes, stirring every 20 seconds or so, so as not to burn, until seeds start to pop, oats gain a little colour and things begin to smell nutty. As soon as this happens, lift the pan off the heat, add your sugar, hold pan back over the heat above the flame, so as to melt the sugar but not burn the granola, and mix with a wooden spatula to coat evenly and disperse sugar. Once melted and left for a few seconds more until starting to stick and sugar caramelizes in colour, put down your pan, on the stove, turn off the heat, and clump granola in the centre of your pan into a circle about 1 thick, and allow to cool. While cooling, prepare your dish. Once ready, gently scoop with fingers or a spoon, your granola and sprinkle wherever desired, or store in an air tight container as you would regular granola. 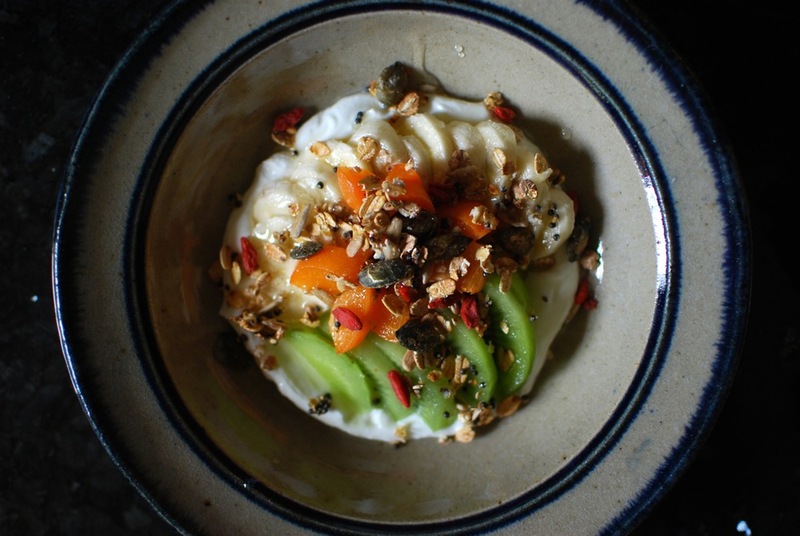 Bowl of Greek Yoghurt, fruits, dried goji berries and a drizzle of melted honey. Sprinkled over soups (see pear and fennel soup) and or salads. With a bowl of milk. As a pound cake topper. Sprinkled on top a smoothie or smoothie bowl. Vary by adding your favourite roughly chopped nuts, and or any seed of your liking. Note, I would recommend adding dried fruits after they have been toasted in the pan, as with regular baked granola, they will become so candied you may break a tooth over them.